Transparency Market Research has published a new report on the global cell surface markers market. According to the report, the global cell surface markers market was valued at US$13.2 bn in 2012 and is expected to be valued at US$23 bn by 2019. The report, titled ‘Cell Surface Markers Market - Global Industry Analysis, Size, Share, Growth, Trends and Forecast, 2012 - 2018’, states that the global cell surface markers market is expected to expand at an 8.10% CAGR during the period between 2013 and 2019. Cell surface marker analysis helps determine drug responses and number of ligands in research activities. Cell surface marker analysis is done via technologies such as flow cytometry and hematology analyzers. Cell surface markers are components that categorize and identify cells such as lymphocytes, macrophages, monocytes, tumor cells, and many others. The global cell surface markers market is propelled by factors such as the low incidence of misdiagnosis and reduced cost of diagnosis brought about by usage of cell surface markers. The global cell surface markers market has been witnessing exponential growth owing to automation of technologies and solutions and ease of information management. Developments in healthcare technology and increasing incidence of chronic diseases, especially cancer and autoimmune disorders, are expected to propel the global cell surface markers market during the forecast period. The global cell surface markers market is segmented on the basis of geography, instrument and reagent, and application. Based on instrument and reagent, the global cell surface markers market is classified into reagents and kits, hematology analyzers, and flow cytometry. Hematology analyzers and flow cytometers are the two commonly used types. 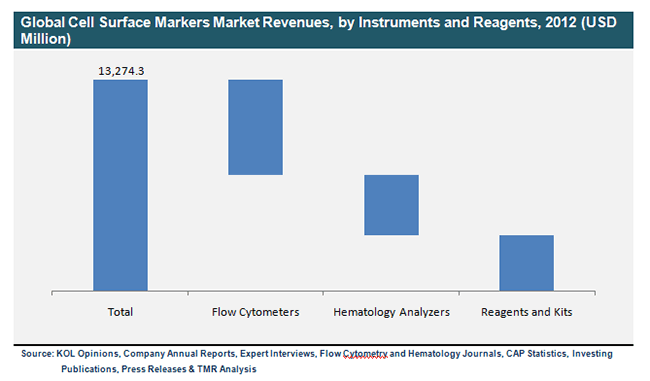 Factors such as efficiency in R&D activities and availability of a variety of flow cytometers are expected to drive the market for flow cytometry and hematology. By geography, the global cell surface markers market is divided into North America, Europe, Asia Pacific, and Rest of the World. North America holds the highest market share, as most of the leading companies in the global cell surface markers market are located in this region. Some of the prominent companies in the global cell surface markers market are Thermo Fischer Scientific, Inc., Nihon Kohden Corporation, Bio-Rad Laboratories, Inc., Beckman Coulter, Inc., Sysmex Corporation, and Janssen Diagnostics, Inc. As technological advancements are rife in North America, the cell surface markers market in this region is expected to develop rapidly in the coming few years. Factors such as growing medical tourism, improved patient rehabilitation, and greater healthcare awareness are all enabling the stellar growth of the cell surface markers market in the forecast period. At present, a wide range of assay technologies is offered in the market for cell surface markers to analyze genotyping, epigenetic modifications, signal transduction, and gene expression and regulation. Some of the commonly offered assay technologies and solutions for cell surface marker analysis are miRNA, mutation analysis, protein expression, PCR array, and DNA methylation. Factors such as the simplicity of the analysis procedures, market consolidation, cost containment of reagents and instruments, and introduction of inexpensive products are expected to propel the global cell surface markers market during the forecast period.